As evidenced by the liquid state of my coconut oil and the 95* degree days that we had last week (no joke), summer is just around the corner. And that means road trips, pool days, BBQs, cherries at the farmer’s market and snacks. Always lots of snacks. At least that’s how my kids roll and summer is no exception. Ok, who am I kidding, that’s how I roll too. I’m all about being prepared when a snack attack hits though. 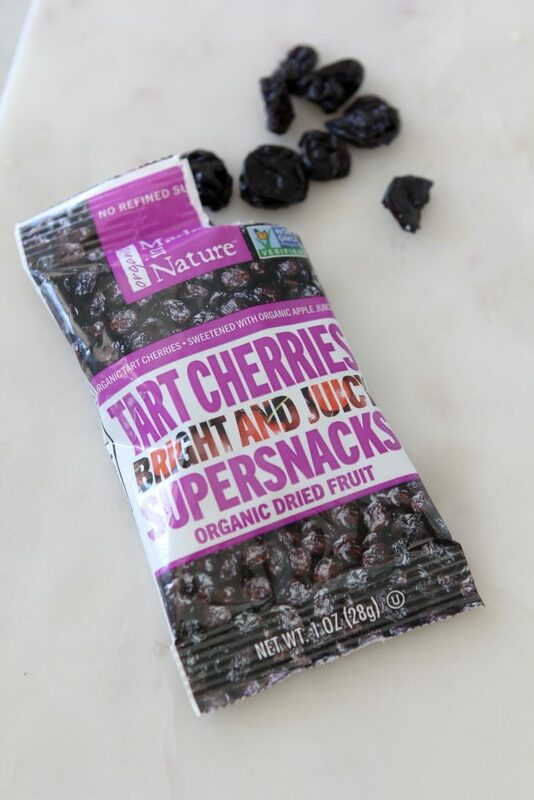 Whether it’s when we head to the pool or on a trip up to the lake, I always like having a healthy snack readily available in lieu of having to stop at a gas station or snack bar for something. Nothing is worse than gas station snacks, am I right? When it comes to snacking, “fail to plan, plan to fail” it quite appropriate. Thankfully, we have companies like Made In Nature that make snack planning convenient and wholesome. We’ve been purchasing Made In Nature snacks at our local Costco and Whole Foods forever so it was such a natural fit for us when they invited me to take part in their summer snacking campaign. I get to talk about summer AND snacks? Game on because those are two of my favorite things. If you’re curious where you can find their products nearest to you, check out their store finder at this link! Like I mentioned, we often get our Made In Nature snacks, such as their Figgy Pops, at Costco. They’re easy to pack up into snack bags and hold up really well traveling. I’m also loving these single serve snack packs as they’re perfect to throw into my purse, beach/pool bag, wherever. It’s SO easy and since I tend to forget things all of the time, I just keep some in my bag. I also have them stashed in the kids’ “snack bin” in the pantry. It’s a basket that I keep tucked in the pantry stocked with healthy kid-friendly snacks so that when Cam & T are home and want a snack I can direct them to the bin and let them pick something. It’s a lifesaver for all of us involved. Not to mention, Made In Nature snacks are great to use in recipes like these Grain-Free Cherry Chocolate Cookies. 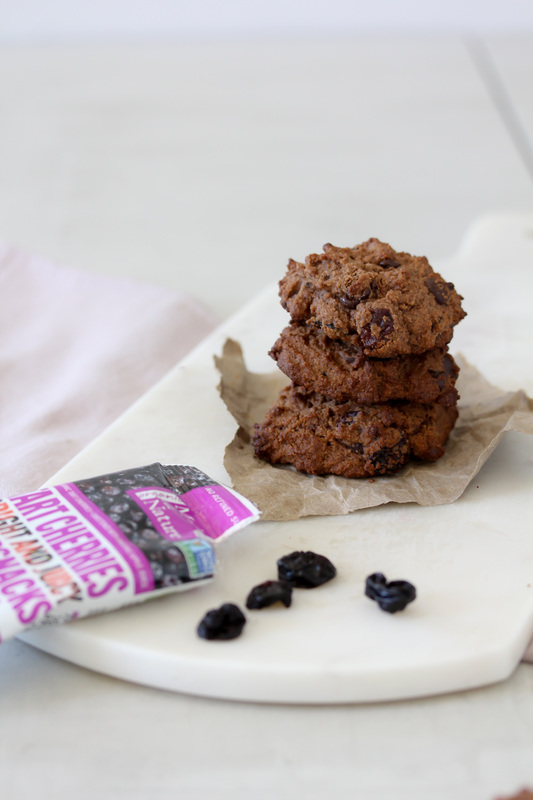 These little cookies are so quick and easy to make and they pack up so easily, it’s anther great snack to add to your summer snack arsenal and can be made and ready to go in just about 20 minutes. As an added bonus these cookies will also leave you feeling completely satisfied after just one. Ok, maybe two but only because they’re really good! As you know, I’m not a huge fan of overly sweetened treats, so I kept the added sweetener (coconut sugar) fairly low in this recipe. 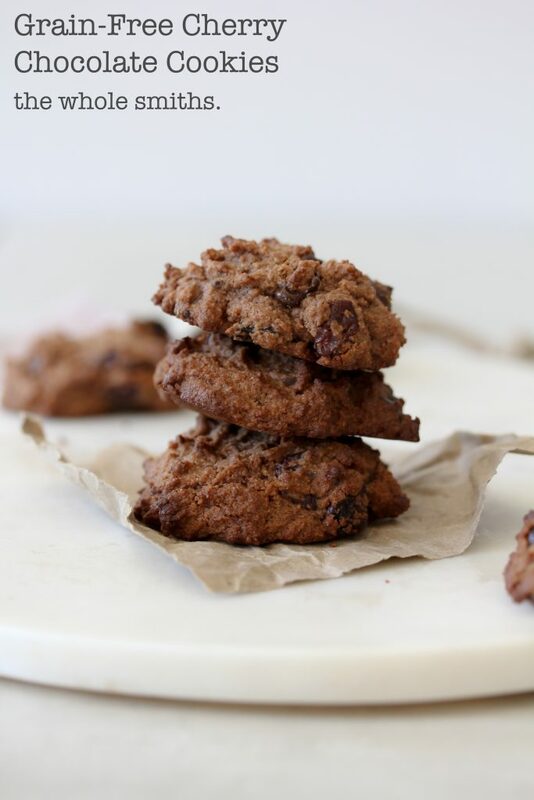 I love the balance of flavors in this cookie as the tartness of the Made In Nature dried cherries pairs up perfectly against the rich chocolate flavor. And because these are low in sugar, I don’t sweat it when I or the kids reach for them to snack on. So let’s hear it, what are some of your favorite summer snacks? Are you a planner? Are you a grab-on-the-go snacker? 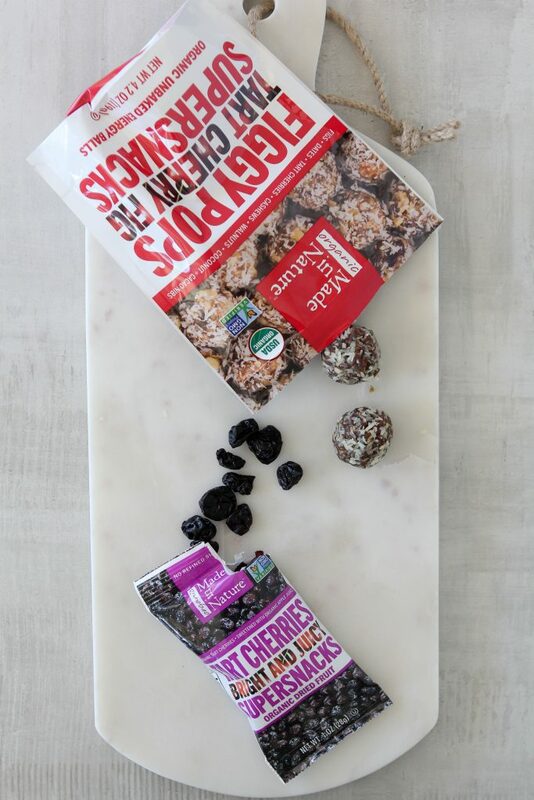 Where are your favorite places to pack up snacks? 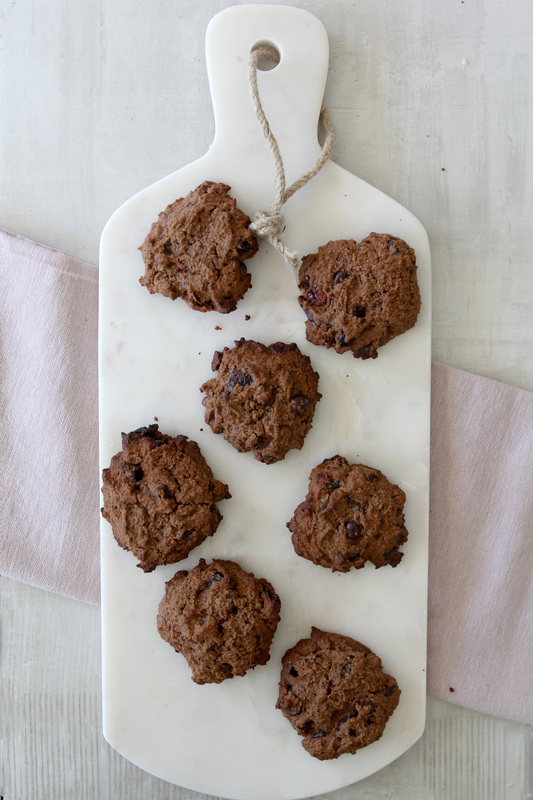 These Grain-Free Cherry Chocolate Cookies from the Whole Smiths will knock your socks off. 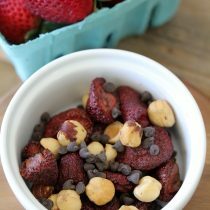 A wholesome easy-to-make snack that's perfect to pack on-the-go. Preheat the oven to 350* F. Line a baking sheet with parchment paper. 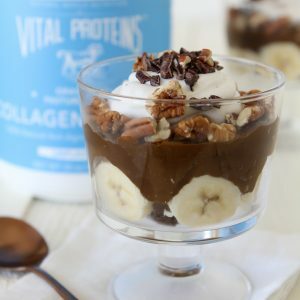 In a large bowl, combine almond, coconut, and tapioca flours with cocoa powder, baking soda and salt. Add the butter and coconut sugar to a stand mixer and beat on medium for 30 seconds until butter and sugar are thoroughly combined. Add the egg, vanilla and almond milk and continue to mix until combined. Set the stand mixer on low and slowly pour the flour mixture into the wet ingredients and mix until combined, about 1 minute. 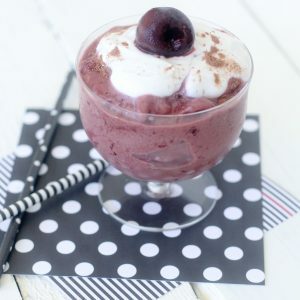 Add the dried cherries and chocolate chips into the bowl and mix until just combined. Drop about 1 and 1/2 tablespoons of cookie dough onto the parchment paper, evenly spacing the cookies. Bake for 11 to 12 minutes and cool on a wire rack when done. Holy smokes! These look so delicious! Can’t wait to try them!